Call today to let Precision Vapor Barriers get your leaning Mobile or Manufactured Home level, straight and true! Home Leveling is often overlooked. Due to factors such as weather and time, it is not uncommon for a mobile or manufactured home to “settle” causing the home to pitch, or lean to one side. Even a slight lean can cause some serious issues. This can weaken the structure of your home. It can also cause issues to your homes foundation. This happens as the weight of your structure causes a twisting of the frame of your mobile or manufactured home. As a mobile or manufactured home leans it is possible to cause strains from the previously mentioned twisting. 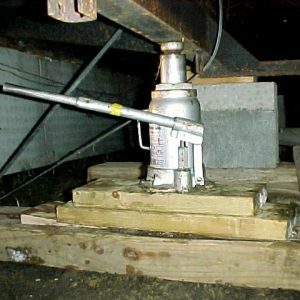 This causes pressures on your homes joints, fasteners and beams. This can cause very expensive repair bills if the homes structure becomes compromised. Precision Vapor Barriers can repair any leveling issues that you may face. Our team of professionals can level your mobile or manufactured home quickly and safely. Our team of professionals at Precision Vapor Barriers are qualified, licensed and insured. Schedule a Precision Vapor Barriers free* home inspection and estimate. Our professional staff will schedule an inspection at your convenience.